Every week during our accelerator program, the teams have to choose a “Big Rock” goal for the week. If they don’t meet that goal, they have to do something like sing karaoke during our team meeting or tell an embarrassing childhood story. The MergeLane team plays too. Since we’re trying to help our teams think bigger, I decided I’d pick something BIG. We’re pursuing more corporate sponsors at MergeLane, so I set my goal to get a meeting with a major car company. I got the meeting, but I was a day late. 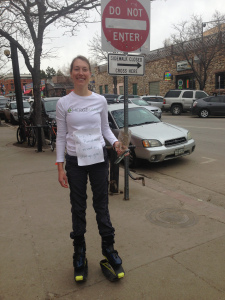 My co-founder Sue usually names the penalties, and her pick for me was to take Atomic Fireball candies out on Boulder’s Pearl Street mall and pass them out to strangers while telling them that I had missed my MergeLane goal. I came up with the idea of wearing my Kangoo Jumps, bouncing boots for aerobic fitness. They reduce the impact on the joints and you burn more calories than regular running, but they look EXTREMELY odd. Although this might seem embarrassing to most people, I was secretly thrilled. This penalty combined my two favorite things — exercising and having an excuse to tell strangers about the cool things we’re doing at MergeLane. I had some surprises in the execution. I was tired from a big run the day before. Then, when I went to the old-time candy store in town to buy Atomic Fireballs, I found 25 10-year-olds waiting in line in front of me. After my one-hour candy excursion, I was psyched to use my Kangoo Jumps run as an excuse to talk to potential investors and entrepreneurs. I passed tons of hip startupsters and seeming Boulder investor types (you can make a rash judgment by the assumed price tag of the carbon-fiber bikes) on my way to get candy, but an hour later I found only tourists and college students. Saving grace: one female entrepreneur asked me for a MergeLane business card. My punishment was actually a punishment, but I think it worked. I was bound and determined to meet my Big Rock for the next week, and I was reminded of how important it is to be held accountable by people you respect. One of the best and worst things about running your own startup is that you are mainly accountable to yourself. A key benefit of an accelerator – and my co-founder team – is adding many other points of accountability.